mBit casino were launched in 2014, making them one of the original crypto-specific casinos. They specialize purely in cryptocurrency deposits and withdrawals and offer a full suite of casino games, live dealers and even a sportsbook. In conclusion, our stress-tests found the operator to be highly competent in a number of areas. The registration and deposit process took us no more than a few minutes, which then allowed us to start testing the games instantly. We were impressed by the range of games available, as well as the presence of a sportsbook with live betting. Moreover, we were free from concerns knowing that every game we played was backed up by a provably fair guarantee, which was further amplified by the fact that mBit hold a gaming license from the Curacao authorities. To complete the in-depth mBit review process, we were also very impressed at the time it took to receive our winnings. Although we were advised it could take up to a couple of hours, the funds were returned back to our wallet within a few minutes. All in all, mBit are up there as one of the best crypto casinos in the market. We at BitBettors are strong advocates of online casino bonuses. Why? Not only does it give you a chance to boost your betting balance, but they also offer the opportunity to test out a platform before you commit long term. When you register an account at mBit for the first time, you will be awarded a 110% matched deposit bonus of up to 250mBTC (or the cryptocurrency equivalent of your choice). 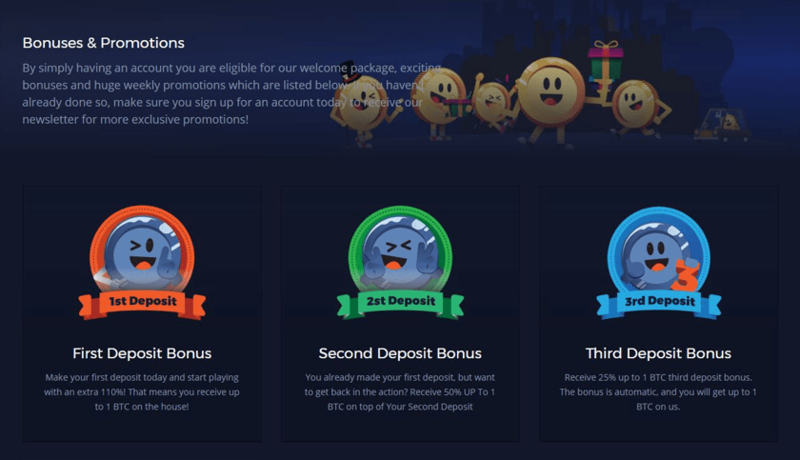 In a rather bold move, Mbit also offer matched bonuses on your second and third deposits too, with two additional 50% bonuses up to 50mBTC. Recognizing the importance of retaining their players long-term, mBit also offer ongoing bonuses for existing players too. This includes a weekly 50% reload bonus of up to 200mBTC, a 20% cashback on loses every Thursday and then a further 50% reload on Friday’s. For those who fall under the high-roller category, mBit also has a dedicated VIP program. Benefits include a personal VIP manager, redeemable loyalty points and extra bonuses. The mBit casino platform is comprehensive in nature, with a vast range of table games on offer such as roulette, blackjack and baccarat. Moreover, each traditional table game is also available with a twist, including a remarkable 14 different versions of blackjack. The slot machine department at mBit is also highly significant in choice, including a variety of 3 and 5 line slots, as well as jackpot machines too. Do you prefer a live dealer experience? This is also available at mBit on the majority of traditional casino games, including a real-life wheel of fortune style game called Dream Catcher. Arguably one of the greatest features available at mBit is that is boast is fully functional sports betting facility. No matter what the sport, whether its soccer, basketball or baseball, you will find a range of markets available, all at really competitive odds. Furthermore, there is even a live betting platform that allows you place bets during the game. This, along with the rest of the mBit betting platform, is also available through your device, which is great is you like gambling on the go. Do you have a preferred software developer that you like to use? MBit have a wide-range of providers that they use to facilitate their gameplay, which we have listed below. Keep checking back as the casino is always adding to their list. When it comes to opening an account at mBit casino, there is no need to supply any personal information other than an email address and phone number. This is ensure that you can regain access to your account in the event that you misplace your log in details. Nevertheless, this means that you can deposit funds in to your newly created account within just a few minutes. Cryptocurrency deposits are free and they are credited to your account instantly. When requesting a withdrawal of your winnings, mBit generally transfer them back to your account within minutes, up to a maximum of a couple of hours if the network is busy. This is in stark contrast to that of a traditional online casino, as they must first verify your identity and request documentation prior to validating a withdrawal. Moreover, banking delays days before the funds are available back in your account. As a purely crypto-specific casino, mBit does not accept fiat currency payments such as a debit or credit card. However, if you are looking to take full advantage of the many benefits that blockchain casinos offer, you can deposit up to five different coins – which we have listed below. Although crypto-casinos allow you to open an anonymous account without submitting any personal details, there are some restrictions on who can play at mBit. This is due to the fact that their license issuer – the Curacao Gaming Board, do not have the remit to regulate certain nations. This includes Italy, the U.K and the U.S. Outside of these three jurisdictions, players from all over the world are able to register an account freely. It is worth remembering that although these player restrictions exist, mBit do not ask for your nationality when you sign up, nor when you attempt to make a deposit or withdrawal. This means that as long as the player withheld their IP location (through an anonymous browser, for example), then it would be practically impossible for these restrictions to be upheld. However, although we don’t advice this at BitBettors, we thought it was worth making the point. Depositing funds in to a new casino can at time be a daunting task, especially if the operator is question falls under the unregulated bracket. However, to ease these concerns, mBit hold a fully-fledged gambling license from the Curacao government. This provides the player with an additional regulatory oversight, as licensing conditions are highly stringent. This regards a variety of demands such as storing play funds in a separate account and ensuring that crime is kept away from the platform. Although now becoming more wide-spread, crypto-casinos that hold a gambling license is still a rare occurrence, so it is assuring that mBit have one. Even more importantly for the player is that mBit casino offers provably fair assurances on all of their software games. This protocol, fueled by the art of cryptography, is a transparent security feature that guarantees each and every gaming outcome has been generate on a true, fair and random basis. This gaming data can then be independently verified by external stakeholders (including the player) to ensure the protocol has not been tampered with. Ultimately, provably fair guarantees that mBit cannot adjust the outcome of their games. A further security feature for the player is that no sensitive financial details are ever exchanged with mBit. Unlike a traditional fiat casino, whereby you will need to enter your debit/credit card details, players simply need to transfer cryptocurrency from their wallet to the mBit platform. Prior to choosing a new casino to register with, it is always important to consider their customer support facilities. Our mBit casino review found that customer service rates highly for both speed and efficiency. The most preferable option is to contact mBit through their live chat facility, which can be accessed from anywhere in the world 24 hours a day. Response times are in the seconds and in most cases, issues can be resolved without delay. Alternatively, if for some reason the live chat box is not available, you can also email the mBit team directly. Our tests averaged a response time of less than an hour, which although still fairly quick, was less useful than live chat. No phone numbers are available for the mBit support team, however this is standard practice in the world of crypto-gaming.